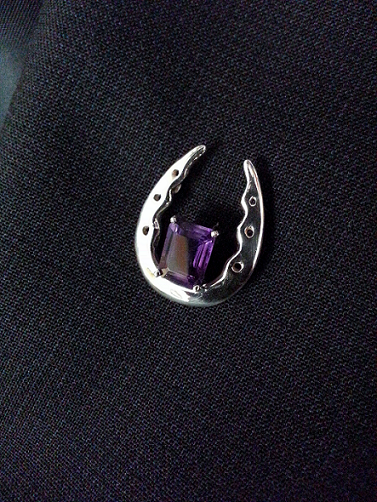 This horse shoe with 8x6mm Amethyst is a real head turner. Perfect for the show ring or just in the stands cheering. Double clutches makes this a durable and safe pin to wear anywhere. Dimension: Dimensions: 3/4 inches wide x 1 inch tall. Available in 14kt yellow gold, 14kt white gold, and sterling silver. Prices do vary. If you would like a different colored stone please let us know in the comments box below.